Earthlink Archives · Stop the Cap! Charter Communications is raising rates for its dwindling number of Earthlink customers still subscribed to Earthlink’s legacy internet plans in an effort to avoid Spectrum’s entry-level $65 internet service. Charter has started to notify customers grandfathered on an Earthlink plan that they are going to be gradually stepping rates up, starting with a $5 increase. Stop the Cap! reader Christopher Rzatkiewicz shared a copy of the bad news on his recent Spectrum bill. Charter Communications terminated its agreement allowing Earthlink to sell its service over its cable broadband network after completing its merger deal with Time Warner Cable and Bright House Networks. That left an undetermined number of Earthlink customers paying $41.95 a month for Standard Earthlink 15/1 Mbps service, considerably cheaper than Time Warner Cable’s identical, $59.99 15/1 Mbps plan. This last loophole allowed some customers to avoid switching to Spectrum’s more costly $65 entry-level 100/10 Mbps plan (200 Mbps in select areas). But now Spectrum is gradually taking away Earthlink’s price advantage. The new rate is $46.95 a month, and is likely to continue increasing in similar increments at least twice a year, until its price reaches about $60. To help convince customers still holding on to older service plans to switch to Spectrum plans and pricing, Charter will continue raising rates on older legacy plans from Time Warner Cable, Bright House, and Earthlink to remove any price advantages those plans may have originally had. That will allow Charter to eventually claim its plans are always cheaper and better. ¹ Earthlink service is no longer available to Charter/Spectrum customers. If you cancel your grandfathered Earthlink plan, you cannot return to this plan in the future. ² Time Warner Cable internet service is grandfathered and no longer available to new customers. If you switch to a Spectrum plan, you cannot return to a Time Warner Cable plan. ³ To qualify as a new customer, either cancel service in your name and enroll as a new customer under another household member’s name or cancel existing service and wait 30 days to re-qualify as a new customer. ⁴ This plan offers 200 Mbps download speed in select areas. Charter Communications has ended more than a decade-long relationship between Earthlink and Time Warner Cable by quietly pulling the plug on Earthlink’s cable broadband service. As far back as November, Spectrum customer service agents have begun turning down customer requests to enroll in the alternative broadband service distributed by Spectrum/Time Warner Cable’s network and charged to monthly cable bills. With the exception of e-mail service, Earthlink over Time Warner Cable (and later Spectrum) was indistinguishable from cable company internet service and traveled over the same network. But customers used to enjoy significant savings by bouncing between new customer promotions from Earthlink and the cable company. Charter officials first closed that loophole by forbidding Earthlink from extending promotional pricing to existing Spectrum or Time Warner Cable broadband customers. Charter has since stopped enrolling new customers altogether. Existing Earthlink customers can keep their service until further notice. Most are enrolled in 15-20 Mbps slower speed tiers originally identical to those offered by Time Warner Cable, but pay less than Spectrum’s standard $65 standalone broadband pricing. “Spectrum now has absolutely no reasonable competition in the N.Y. Capitol District,” complains Stop the Cap! reader Jan Pedersen, who reported Spectrum told him Earthlink was no longer an option. Earthlink does still resell AT&T DSL service in AT&T landline markets. Nine years after Earthlink began promoting its $29.99 six-month offer for alternative broadband service for Time Warner Cable customers, the completion of Charter Communication’s takeover of Time Warner Cable has eliminated a clever way for customers to get broadband rate relief. For almost a decade, savvy broadband-only Time Warner Cable customers have been able to bounce between new customer promotions at Time Warner Cable and Earthlink. 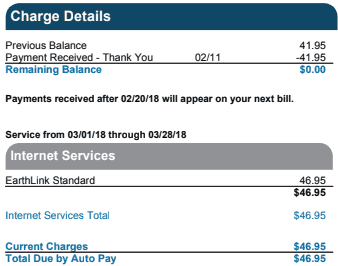 When a year-long promotion with Time Warner Cable ended, a customer could switch seamlessly to Earthlink for six months and pay just $29.99 a month — charged to their Time Warner Cable bill. When the Earthlink promotion ended, customers were entitled to enroll as a new Time Warner Cable broadband customer and pay a lower rate for up to one year. 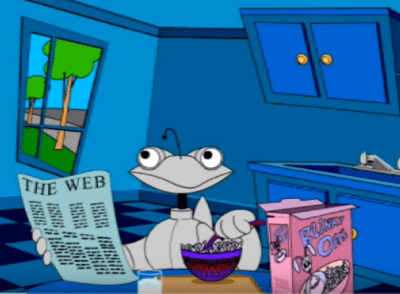 After that, back to Earthlink. Charter Communications closed that loophole this month and now prohibits existing Charter/Spectrum customers from getting promotional rates from Earthlink. Once Charter customers end a broadband-only new customer promotion, currently $44.95 a month for one year, the rate jumps to $64.99… and stays there indefinitely. 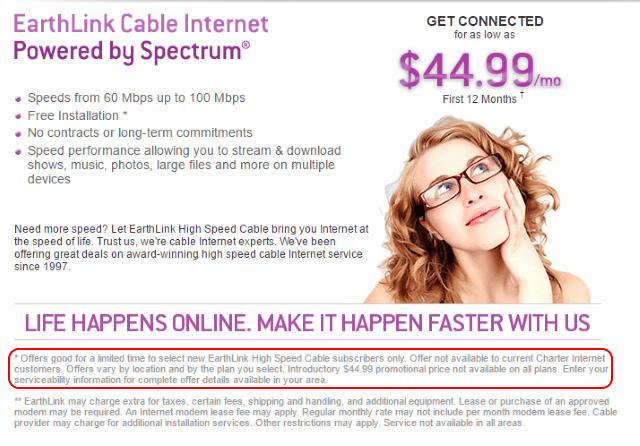 Charter Communications eliminated lower-cost broadband options for its customers, but claims its single remaining advertised offer (60Mbps in non-Maxx areas, 100Mbps in former TWC Maxx cities) offers a greater value because it is faster than Time Warner Cable’s Standard Internet 15Mbps plan and ends Time Warner’s practice of charging a $10 modem rental fee. But it also costs more than earlier promotions at Earthlink ($29.99) and Time Warner Cable ($34.95). 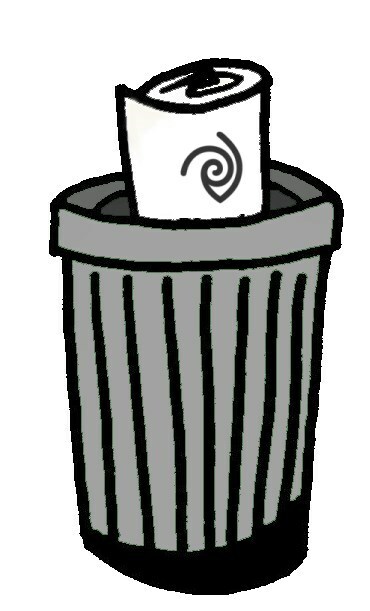 Charter has junked Earthlink’s former promotion for Time Warner Cable customers. Charter/Spectrum customers hoping for a better promotion from Earthlink are now also out of luck. Earthlink is entirely dependent on Charter Communications allowing them to resell service over Charter’s cable lines. 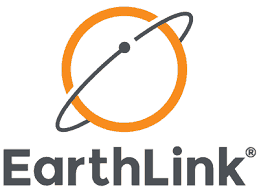 Earthlink has been cautious not to outcompete either Charter or its predecessor Time Warner Cable, and charges roughly the same rates as a customer would get direct from either cable operator. The only benefit of the arrangement for customers was the ability to bounce between new customer promotions to pay the new customer rate indefinitely, but Charter has made sure that practice stops. Gennifer did manage to ultimately outwit Charter, but at the cost of time and inconvenience. 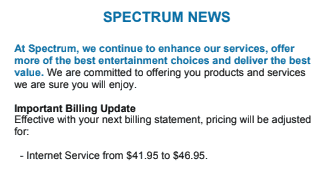 Important Billing Update: At Spectrum, we continue to enhance our services, offer more of the best entertainment choices and deliver the best value. We are committed to offering you products and services we are sure you will enjoy. Internet Service from $59.99 to $64.99. If you are currently on a discounted rate, you will not realize an increase until the end of your promotional period. The rate increase means Charter/Spectrum’s nationally available, entry-level broadband plan will now cost customers $64.99 a month. The company is also hiking rates on its Ultra tier (300Mbps in former Time Warner Cable Maxx markets, 100Mbps in most other markets) by $5 to $104.99. Customers signed up to Spectrum’s base 60Mbps internet plan may be able to threaten their way to a lower price by contacting customer service and informing them you plan to switch to Earthlink, which is offering lower-speed plans as low as $29.99 a month for six months. 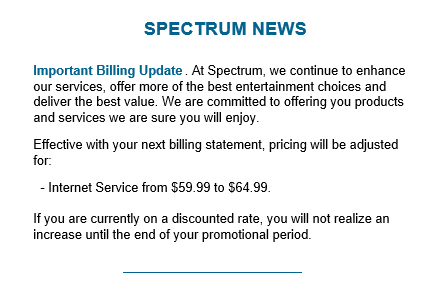 Charter Spectrum has given many complaining customers a 12-month retention plan priced at $39.99 or $44.95 a month for 60Mbps.